Published in the Dover Express, 11 April, 1980. Round Tower Street, now removed from the map, had very nearly disappeared many years ago, its place having been taken to a great extent, by the part of the Dover and Deal Railway which connected the South-Eastern with the London and Chatham system. To present-day readers the title Southern Railway has become so familiar that it is in danger of being forgotten that, prior to the Dover and Deal Railway being made, between 1878 and 1881, there was no junction in the Pier district between the quite distinct LCDR and the SER systems, which, in 1899 were united as the South Eastern and Chatham Railway. The street ran in the same direction as the sea wall, which was built by Sir John Clark, and continued by Sir John Thompson, in the time of Henry VIII; and the street took its name from the round towers, or bulwarks, which stood on that wall, and which are to be seen in the stained glass window, in the Maison Dieu Hall, representing the embarkation of Henry VIII at Dover in the year 1529. In that design, which is borrowed from a celebrated picture at Windsor Castle, two round towers are shown. The foundations of the towers have been discovered. 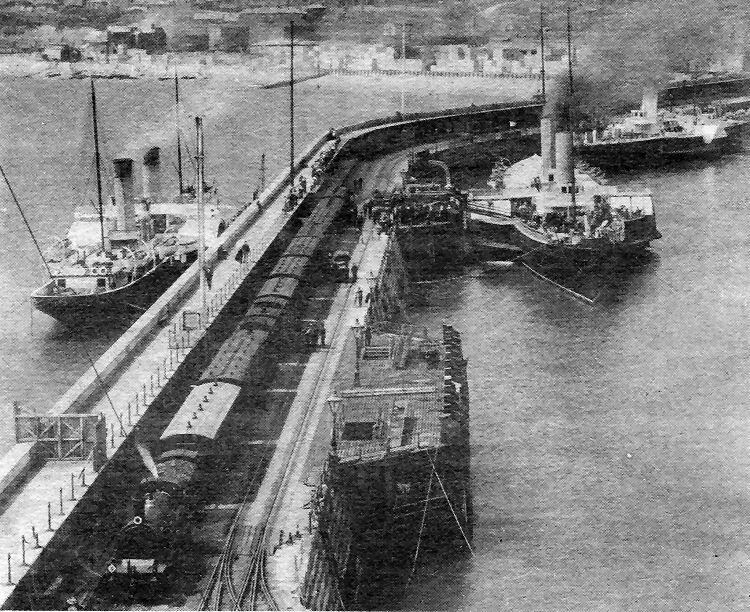 One is said to have been unearthed near where the Dover to Folkestone railway line crosses Elizabeth Street, and the other between the Croswell Crossing and the spot on which the Continental Goods Shed stood prior to its demolition in 1933, in connection with the construction of the cross-Channel Train Ferry Dock. In the Dover Express of 9 March 1866 it was reported that "By the demolition of the buildings in Round Tower Street, a portion of King Henry the Eighth’s Tower has been disinterred. It is said that archaeologists are about to petition the London, Chatham and Dover Railway Company to make them a present of the piece of ground — it being understood that it will not be used for other purposes.“ But we have not been able to discover what the outcome of that petition was. Round Tower Street, when intact, never contained any public buildings, with the exception of a small Primitive Methodist chapel, built in 1874, during the time that the Rev Thomas Russell was circuit minister; and that was taken down a few years later, in the making of the Dover and Deal Railway. On the south-east side of Round Tower Street, the Artizans’ Dwellings were built, and opened in 1886, by the Dover Artizans’ Dwellings Company, and built at a cost of £5,000. This large five-storey block, better known as Victoria Dwellings, was designed after the Peabody Buildings in London, the capital of the company being mainly subscribed by Mr Robert Chignell and Dr Astley. It was the outcome of the establishment in Dover of a Kyrle Society, in 1882. The site of this block of workers’ flats was previously occupied by the London Hotel, which had its front in Council House Street, and its rear in Round Tower Street, At this hotel, Madame Bonaparte stayed in June, 1805, when her brother-in-law, Napoleon, refused her admission to Prance. Condemned as a slum Victoria Dwellings, like Seven Star Street flats close by, were demolished in recent years and the land is now part of the Western Docks area. Paddle steamers berthed on both sides of the Admiralty Pier 80 years ago. Top right the old pilot tower is just visible through the smoke coming from the twin funnels of one of the steamers and on the left the block-yard off Shakespeare Beach, where the concrete blocks for building the Admiralty Harbour were made, is clearly visible. The train in the foreground is the Ostend boat train. At the seaward berth is the Mary Beatrice, built by Samuda for the South Eastern Railway in 1882. The twin-funnelled steamer is one of three sister ships, Marie Henriette (II), Princess Clementine or Rapide. Beyond is the Calais packet boat, either the Dover, Calais (II) or Lord Warden (I) built by Denny in 1896 for the London, Chatham and Dover Railway. 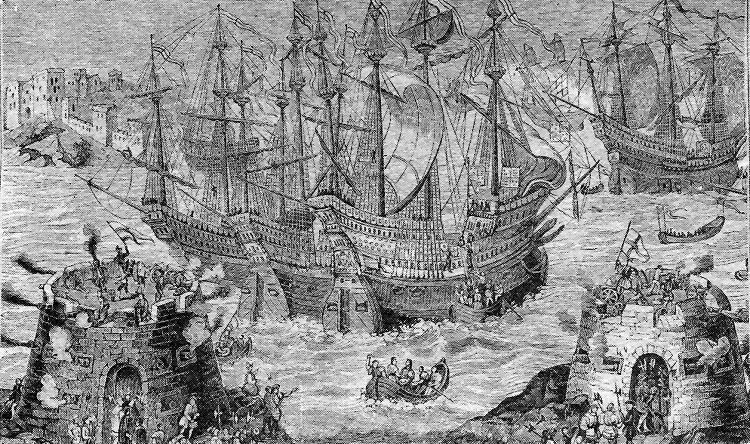 The two defensive towers after which Round Tower Street — now disappeared — was named pictured at the time Henry VIII embarked for France in 1529. The engraving is based on a celebrated picture at Windsor Castle.